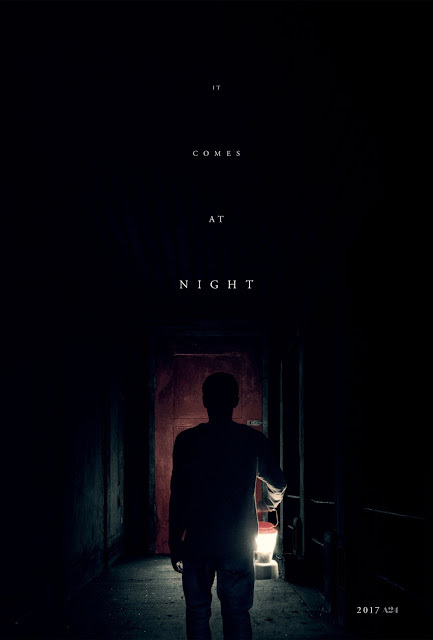 Movie: "It Comes at Night"
A deadly and unknown infectious disease has wiped out much of the population. Those who are not infected do what they can to survive while living in a constant state paranoia of others who may have the disease. "It Comes at Night" is the second feature length film from writer/director Trey Edward Schults, the first being the family drama "Krisha." This movie stars Joel Edgerton, Carmen Ejogo, and Kelvin Harrison Jr. as Paul, Sarah, and their 17-year-old son Travis. The family lives in their rural home isolated in the woods. One evening, a man named Will, played by Christopher Abbott, breaks into their home looking for supplies. After Paul captures him and determines he is not infected with the deadly plague that has claimed most of the population, he strikes up a deal with Will. In exchange for allowing Will's wife Kim, played by Riley Keough, and their young son Andrew, played by Griffin Robert Faulkner, into their home, the family will bring their goats and chickens to Paul's place so they can attempt to establish a little bit of normalcy in the chaos. We were really looking forward to this film for a variety of reasons. It has had a lot of excellent buzz since its premiere at The Overlook Film Festival, and since we love a24, the company that has put out the film, we had high expectations. We are huge fans of Joel Edgerton. He is one of our favorite actors working right now. We have thoroughly enjoyed other recent horror films like "The VVitch," "It Follows," and "The Babadook," as well as Joel Edgerton's thriller "The Gift." We expected "It Comes at Night" to be right up our alley, and honestly, we are a little disappointed. It's the textbook definition of a "slow-burn indie horror," which is not necessarily a bad thing, but here, it's a little bit of a disadvantage to the film. We enjoy movies that take their time to build to their ultimate conclusion, but we're getting ahead of ourselves. Let us discuss what we did like first. "It Comes at Night" is beautifully, magnificently shot with extremely striking images. Schults is able to create some good on again/off again tension throughout its run time because of his expertise behind the camera. His use of these stunning visuals aids in the anxiety the audience will feel as whatever illness that has taken hold of the world slowly creeps up on its next victim, infecting people not only with something that will kill them, but something that will scare them into being overly suspicious and fearful of everything and everyone. The picture is also well acted from everyone involved. Edgerton, Ejogo, Harrison Jr., Abbott, and Keough have to perform a range of traits from determined to sad, scared to cautious, and unguarded to uncomfortable. So, why are we disappointed? Our feelings stem from a lot of different things. A lot of the big "horror" moments happen as dream sequences. We find this to be a lame cop-out thing to do when done repeatedly (which is the case here). Much of the tension comes from the constant waiting to find what the hell actually comes at night. What are all of these people scared of other than this mysterious and fast-moving infectious disease? If you've read the reviews for any of the movies we linked above, you'll see we don't need some big, equally cheap, shoehorned in monster moment shoved in our faces just because it's necessary to have, but we must admit, we hoped for a payoff that never really comes at the end of "It Comes at Night." As we stated above, though Shults is able to establish some semblance of tension, it's nowhere near as spine-chilling or immersive as some of the other titles above. Don't get us wrong, this is not the worst movie we've ever seen, but it honestly feels like a filler episode of "The Walking Dead" or "Fear the Walking Dead," only with much better cinematography. We understand what the movie is trying to do and what it's ultimately trying to say, but we're a little tired of these pseudo-intricate ~*it really makes you think~* types of plots so many modern horror movies rely on in an effort to be different. We get it. "Paranoia is real!" Next.